I've often run into this situation at the bank drive-thru. I pull up, look at the lights above the lanes, and I can't tell for sure if the lane I want is open or closed. At this bank on my way home from work the green light is always on the right. As long as I remember that, I'm OK. If there are other vehicles, I'll get behind one. Sure, I passed up a number of open lanes with this strategy, but I never pull up to a closed one. Always, always go to the window. If the drive-thru is open, the left-most lane is always open. But I've found a better solution. 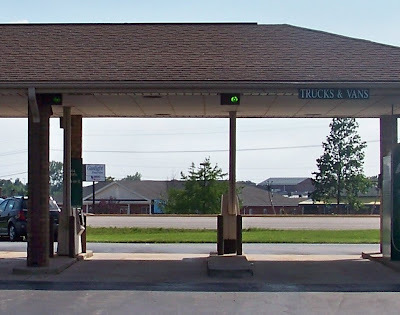 This drive-thru near my home developed a simple sign that is easier for all to see, and provides a significant benefit for color deficient drivers. Brilliant. If we were in 1992 and I still used the bank drive-thru (vs. online banking and the ATM, neither of which is ever closed), I'd seriously consider switching banks for this reason alone. Nice work, Boone County National. You've secured my hypothetical, fourth-dimensional business. What other everyday, driving-around-town experiences have you had like this? I tend to forget about them since I've "worked around" them for so long, but I'm sure there are other common stories. Let me know. But you said elsewhere that green looks white to you and red looks different from green. Myrtone - thanks for your comment. The green used at a typical traffic signal is a different color (at least to me) as the green used in the bank drive-thrus I'm familiar with. In those cases (traffic signals) I can tell the difference. In this case, I cannot. Could it have to do with lighting conditons? That green looks similar to me. I have rad about green-blindnees and these people have only red and blue (not green) receptors so it is easy to see why they would see green as white. Lighting could be a factor, yes. And pure green-blindness does exist, though (from what I understand) it is quite rare. Part of the problem is that color vision deficiency varies widely, so a color-focused solution for one subset of colorblind individuals may not be helpful for others. This makes the better solutions non-color focused (e.g., the OPEN / CLOSED example from this post). Also, I realised that the lights above the lanes are mainly a problem if the Colour deficient motorist is alone in the car, or in the rare case that the front passenger cannot distinguish red and green any clearer. 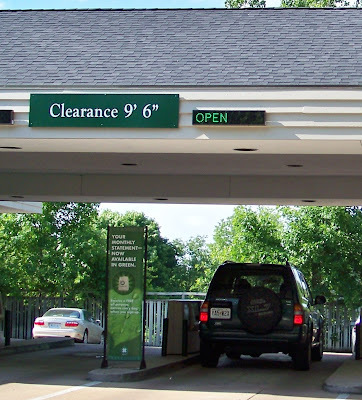 Agreed, though most of the time I used this bank drive-thru to make a transaction I happened to be alone. Maybe others' situations are different. As discussed in the article, it's a relatively moot point anyway. Since I've moved to a new city I have visited my bank exactly zero times to make a transaction that requires a teller.